If you are looking to travel to Vietnam it’s important to make sure you have a proper grasp of the rules, regulations and requirements to get a Vietnam visa. There are some very specific considerations to take into account. Read on to find out all the different information that you need in order to make the process as hassle free and easy as possible. Do I Need a Vietnam Visa? Depending on your passport, if you are planning on staying in Vietnam for any reasonable length of time the answer is yes. It changes from country to country but for those travelling from the West the general length of time you can stay in Vietnam without a visa is only 15 days. Any trip longer than this will need at the least a Vietnam tourist visa. Another thing to bear in mind is that the process has been streamlined for those arriving by air. Entering the country by land is more complicated as there are local borders exclusively reserved for Chinese, Laotian or Cambodian nationals and international crossings that will allow entry to those carrying the proper documentation. Passing through the border can take a little longer by land and it’s even more important that you have a clear understanding of the documents require. If you are planning to travel into Vietnam by land it’s a good idea to check in with the local embassy as they will be able to guide you to the international border crossings and advise precisely what to expect. There are different requirements when it comes to Vietnam visa applications depending on the nationality of the passport you’ll be providing. Luckily though, the process has never been easier, and you can even apply for your Vietnam visa online. It’s best to get your visa with Vietnam-Visa.com because they are safe, reliable, and offer a quick turnaround. Reading this article takes longer than filling out the online application. The somewhat complicated process of obtaining a Vietnam visa has been streamlined in recent years, but it’s still important to check official channels to make sure you are kept abreast of the latest regulations. For those travelling from the West the standard length of time you can stay in Vietnam without a visa is only 15 days. Any longer than that and it is essential to have at least your Vietnam tourist visa which can extend your stay up to 30 days or more. Tourist visas are valid for either 30 or 90 days, with a single-entry 30-day visa costing around $20 and a multiple-entry 30-day visa costing $70. At the time of writing, only United States nationals are able to apply for a 1-year visa. In the past there were only two methods of obtaining a Vietnam visa; you could get a Vietnam visa on arrival or you could apply through your nearest Vietnam embassy or consulate. However, in 2017 a pilot e visa application process was introduced and is now a valid third option. With a visa on arrival (VOA), you can apply for a visa without the need to bring or mail your passport to the Vietnamese embassy. It’s the most popular choice amongst the majority of travellers due to being the most straightforward and cheapest option. The entire application process is online. After you provide the required information it is sent off to the agent and your Vietnam VOA will then be emailed to you directly. Make sure you are using a reliable and reputable agency. 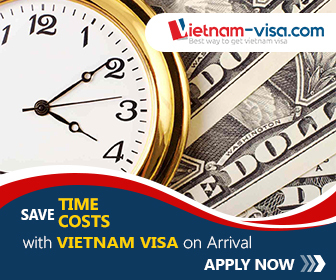 Did you know the application for your VOA with Vietnam-Visa only takes 5 minutes? You’ll have your approval letter in two business days! You will then be emailed the required documents including your VOA approval signed by the Vietnamese immigration authorities which must be printed out and shown on arrival. There will be a further cost incurred when you reach Vietnam to pay the stamping duty which costs $25 for single-entry visas and $50 for multiple-entry visas. VOAs are only valid for those travelling into the country through one of the six international airports in Vietnam. Those looking to cross the border by land will need to visit an embassy or consulate. In 2017 the Vietnamese authorities introduced a pilot system for an alternative online visa application. The process has improved greatly since its inception, but the website still faces issues and there have been cases of applications going AWOL. The fee is typically a little more expensive than that offered by the agents who deal with VOA applications. There are only 40 countries that are eligible for e visa to Vietnam, and they are only currently available for 30-day tourist visas. If you would prefer to visit a Vietnam embassy or consulate the application process can take a little longer and the fees are often much higher unless you’re visiting a local embassy such as the one in Cambodia. They will help walk you through the entire process and will be the most up-to-date with the precise requirements and regulations on Vietnamese travel, but all that information is available to you online with due research and it’s often just as easy to ask questions of an agency. It is possible to mail your passport to the Vietnam embassy but this means your passport is out of your care for up to 2 weeks or longer, a fact that makes some people a little nervous. Postal application is still the preferred option if the embassy is nowhere near where you live or for those who don’t have the time to travel all the way to a consulate. This method is somewhat outdated as it is a slow process, requires traveling to the embassy or consulate, and you may not have your passport for a few weeks. Thus, we highly suggest you get a VOA. Much the same as travelling to most other countries, going to Vietnam requires you to have a passport that is valid for up to six months after the date of arrival. You will likely be reminded of this fact when booking your tickets but it’s an important consideration that could mean barred entry into the country, which is bound to put a damper on any trip. In the past there have been reports of multiple visitors being refused entry due to having damaged passports. If your passport has any visible damage it may be best to have it replaced before your Vietnam trip. Another thing to note is that it’s standard practice when checking into Vietnamese hotels for them to take your passport to send a copy to the local police. Be prepared for this and make sure to return your passport to a safe and secure place. As noted before, the land borders are a little more in-depth with their inspections and entry or exit through Laos and Cambodia can be especially slow. The border with China is a little more efficient but you will still face tighter scrutiny than those traveling through an airport. Whether by land or air, the upper limits of the most common products taken through borders are 400 cigarettes and 1.5 liters of spirits. If you are carrying over $5,000 in currency it must be declared. Medical immunisation is highly recommended when travelling abroad. It’s important to check travel advisories regarding any area that you are looking to visit, especially those with a greater risk of contracting certain diseases you may not be equipped to deal with in the West. Typical recommended immunisations for Vietnam are tetanus, diphtheria, measles, mumps and rubella, as well as other water-borne diseases such as hepatitis A and typhoid. There are certain countries where you do not need a visa at all to visit Vietnam as long as the length of your stay doesn’t exceed a specific amount of time. You can stay for up to 14 days if you are from Myanmar or Brunei, and 15 days for those travelling from Belarus, Finland, Denmark, UK, Sweden, Spain, South Korea, Norway, Japan, Italy, Germany, France, Russia or Spain. If travelling from the Philippines you can stay up to 21 days and those coming from Cambodia, Laos, Singapore, Indonesia, Malaysia or Thailand can stay for up to 30 days. It is possible to arrange an extension to your visa if necessary and it can cost as little as $10 when organised through an agent. You should bear in mind that it can take up to 10 days for the application to go through and the length of the extension depends on what visa you already have in place. What Information Do I Need to Provide for a Vietnam Visa Application? • Your name as it appears exactly on your passport. There have been cases of visitors being turned away due to misspellings or incorrect information, particularly when self-completing the e-visa application forms. Name placement or order doesn’t really matter as long as all names are provided as they are on the passport. • Date of birth. In Vietnam the format for giving dates is DD/MM/YY. • Nationality. This must match the passport you are using to enter the country, and as mentioned before, the passport must be valid for at least 6 months from the date of arrival. • Passport number as it appears exactly on your passport. • Date of arrival. You must fill in a suitable date of arrival, which is registered on your official visa approval letter and then signed by the Vietnamese immigration authorities. You can choose to arrive later than this date if something comes up, but you cannot enter the country earlier than the date given on the application. • Airport of arrival. There are currently six different airports in Vietnam that you can use to enter the country with a VOA application. If you’ve secured your visa through the embassy you are able to enter through smaller airports, but they aren’t served by any major airlines. • Purpose of visit. A simple answer of “business” or “pleasure” is normally sufficient. • Type of Vietnam visa required. You will need to specify whether you are looking to get a 1-month or 3-month visa and choose between single or multiple entry. There are a few more points that you should bear in mind when applying for a Vietnam visa. Firstly, if you are using a Vietnam VOA your agents may talk to you in months, however, your main concern should be the visa’s validity in number of days. If you overstay the visa by even a day you will be charged for a 3-month visa if your exit date exceeds that number. When using a VOA, as the name suggests, you have to officially acquire the visa on entry into the country, which can slow your passage through the airport. If you really don’t like waiting you might be better served spending the extra money to have the visa approved through an embassy. This caveat is only really applicable during high season and when going through one of the major airports such as Tan Son Nhat. During the quieter months you’ll be waiting no longer than 15 minutes on your VOA. Another thing to consider is local holidays. Public holidays, in particular Tet (Vietnamese New Year), can seriously delay visa applications through embassy or an agent. Apply with plenty of time if the application process passes through any such date. Travelling to Vietnam is easier than it’s ever been and there is a wealth of further information and assistance available making sure you have everything you need in place. The embassies and consulates are the best point of contact for the most up-to-date information and their assistance and advice is free, so it’s always recommended that you check in. When it comes to getting a visa, however, using a reputable and reliable agent to secure a VOA is definitely the way to go; it often works out cheaper and much quicker than other options. The Vietnam visa cost varies depending on the channel chosen and it’s always recommended you compare different options before you commit. Why visit an embassy or consulate? Take 5 minutes out of your day and apply for your Vietnam Visa On Arrival today!